It’s amazing how refreshingly honest Fed officials can be when they are approaching or have just retired! The classic was when Dallas Fed Chairman Richard Fisher admitted that for the academic veneer they used in its justification, the real aim of QE was boosting stocks. Now, with retirement looming sometime this year, Fed voting member Bill Dudley gave an excellent interview to the Financial Times. 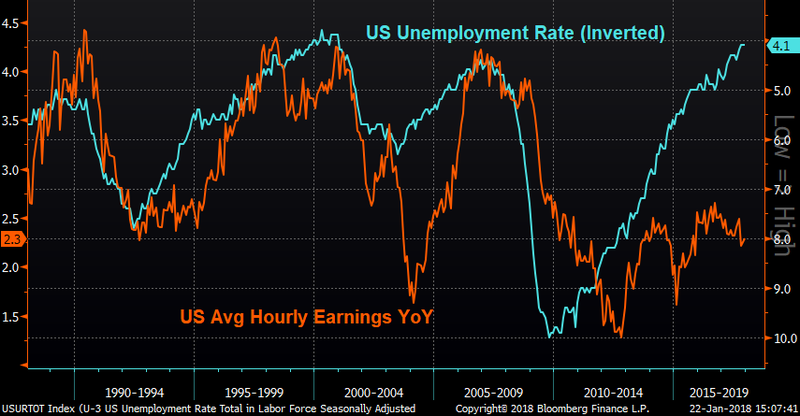 Covering the whole gamut of topics related to the Fed, ranging from the business cycle and demographics, to fiscal stimulus and the labor market, Dudley even addresses the counter-intuitive relationship that has persisted between financial conditions and rate hikes. Below are a few select quotes, but the full text is well worth reading. This month marks the start of a wind down in purchases by the ECB, moving from a target of 60 billion to 30 billion per month. And while there is yet to be a hard and fast ending, the October Press Release of the Governing Council maintaining that purchases will last “until the end of September 2018, or beyond, if necessary...” Jens Weidmann reiterated his previous call to establish a concrete date for ending bond purchases in an interview with Frankfurter Allgemeine Zeitung, saying “I think that [ending the ECB bond buying program this year] would be appropriate from today’s perspective”. Whether or not other members of the Governing Council agree with this prognosis now, Weidmann’s words may eventually carry more weight as he is considered to be among the front runners to replace Mario Draghi as ECB President when Draghi’s term ends in late 2019.